Someone once told me that a homemade breakfast sausage (in fact any breakfast sausage) should be bland so that the sausage flavour isn't dominant to the other breakfast items on the plate. I understand the point that this person was trying to make but "bland" is a strong word even if the flavour is not. For sure, a heavily spiced, herby or smoked sausage wouldn't be right so for me the key to a good homemade breakfast sausage recipe is a light seasoning mix that serves to bring out the flavours of the meat. Both contain small quantities of ginger which you won't be able to detect in the taste but ginger in these small quantities serves to enhance the flavours of the other herbs and spices around it. Before going any further I recommend that you read my section on making homemade sausage to get a feel for the sausage making process as a whole. The "banger" is so called because of its tendency to pop / explode in the pan during cooking. A feature of many British sausages is the use of rusk (breadcrumb) in the mix which is used to soak up extra liquid added to help emulsify the sausage. When the sausage is cooked, the water in the breadcrumb forms a head of steam and it's this expansion that causes the casing to rupture or explode, hence the term "banger". Gentle cooking as I've explained in my article how to cook sausage slows down the expansion of steam in the sausage and so reducing the risk of explosion. To the commercial sausage maker rusk is available in bulk and described as pinhead rusk, you can get it from any butchers supply store but beware that it usually comes in a 10kg (20lb) bag! For us home makers the best alternative is the Japanese breadcrumb called panko. You can easily buy panko breadcrumb from Amazon. Certainly avoid any shop bought breadcrumbs that have any additional seasonings. I have to say that this recipe is my default for catering so I make it in 10 kilo batches so I've divided by 10 for this recipe and made 1Kg (2.2lbs). 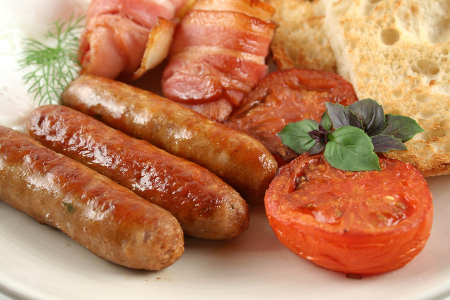 British breakfast sausage is traditionally stuffed into a sheeps casing which is much lighter on the palette than a hog casing. Sheeps casing is however easier to break when stuffing so make sure that you have rinsed your casing well and soaked it in lukewarm water for 30 minutes prior to stuffing. This will make it easier to work with. 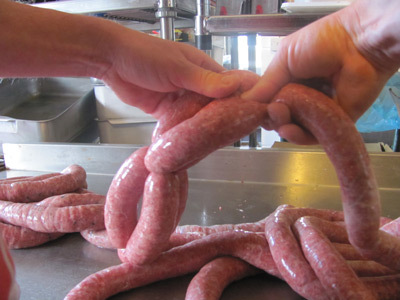 You'll need to prepare about 4 metres (14 feet) of casing for the quantity of sausage made. Gluten is present in rusk / breadcrumb. If you want to make a gluten free version of this recipe then try using soy protein (TVP), it changes the flavour slightly but keeps a good texture makes a great low carb alternative. Cut the pork up into a 1" dice and run it through the grinder using a 4mm plate. Add the seasoning mix to the ground meat in a mixing bowl and knead well until you have a good emulsion and the seasoning is evenly distributed - this will take about 5 minutes. Finally add the rusk / breadcrumb and mix in. You should now have a firm sticky paste. Run this paste through the grinder on the same plate for a second time and then you're ready to stuff. Stuff into sheeps casing taking care not to overfill the casing otherwise it will burst when you try to make your links. Links should be approximately 10cm or 4 inches long. Place your links in the refrigerator overnight covered in a paper towel and then you're ready for breakfast. For me the best way to cook the breakfast banger is direct on the grill. I guess it will come as no surprise that this homemade breakfast sausage recipe is so called because it was made on the small farms in the American Midwest. Mix all the seasonings together in a large bowl and place it in the refrigerator. Grind the meat through a 6mm (¼") plate and add it to the seasoning. Give yourself a good 5 minute workout by kneading the meat to ensure even distribution of the seasoning throughout the meat. Stuff the meat into sheeps casings and make your links approximately 10cm or 4 inches long. Place your links in the refrigerator overnight covered with a paper towel and then grill or fry for breakfast!